Johnny Depp and Marilyn Manson collaborating on song? It’s an odd match, but art is art. 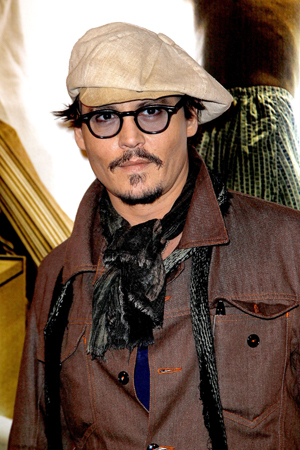 Johnny Depp and Marilyn Manson are in cahoots to cover a Carly Simon song, for the rocker’s next album. Will this work? If somebody proposed a new snack food entailing a cheese-filled pickle wrapped in bacon, dipped in chocolate, deep-fried and lightly dusted with woodchips, what would you say? Well, this is kind of like that… According to reports, Marilyn Manson announced that he will be collaborating with Mr. Ageless – Johnny Depp, himself – on a song for his new album. Oh yeah, this is happening. The duo are set to cover Carly Simon’s hit song “You’re so Vain” for Manson’s upcoming album Born Villain. Now, we know the two are friends; after all, the actor invited Manson to the premiere of Pirates of the Caribbean: Dead Man’s Chest, as his date. But this is such a huge step, are they ready to take it to the next level? As to the song choice, if it’s not made any bitterer than it already is, it will work. But trying to picture Manson singing any Carly Simon song is like imagining a pencil crayon trying to put on mittens… It doesn’t make any sense! But seeing is believing. If the two have more in common than adoration for eyeliner, surely they can create an amazing rendition of the 1970’s hit. Time will tell. Did Johnny Depp say Americans were stupid?